Seat IBE concept car | What Car? 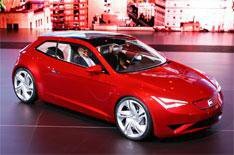 Seats latest concept car which was unveiled at the Paris motor show today demonstrates how the company sees its future developing in the electric car sector and with the promise of zero local emissions. The IBE is powered by an electric motor with a maximum output of 101bhp, which will take the car up to 62mph in 9.7 seconds and on to a top speed of 100mph. While continuous power is limited to 67bhp, it means that the car will have a range of 81 miles: perfect if youll spend most of your time in town, but might want to venture beyond the suburbs once in a while. Despite being shorter than the Seat Ibiza supermini, there are four seats for you and three others to fill in the IBEs sports-coupe body, as well as all the toys you could want to impress your friends. For example, you can connect a smart phone wirelessly to the IBE. Not only can you play music stored on your phone through the cars speakers, but you can also do a check of the cars systems, such as having a look at the trip computer and seeing how the batterys doing. Other files on your phone can also be downloaded, with an array of apps to help you do anything else including navigation. Theres no information yet whether the IBE will go in to production, but Seat says that the concept cars design hints at how its next generation of models will look. The first of our two videos looks at the VW Group's electric vehicles - which include the Seat IBE - and the second report comes from the group's pre-show launch party. Sit back and soak up the atmosphere with whatcar.com.